Ken Nagle was a finalist in the first Great Designer Search and joined Wizards of the Coast as a design intern. He has since gone on to work on twelve Magic expansions, including four of which he led, as well as leading the design of Archenemy and the first Commander decks. It's Eldritch Moon Preview Week here at DailyMTG! As the lead designer of Eldritch Moon, I've managed to secure not one, but two preview cards. To show a behind-the-scenes look into the making of Eldritch Moon, I've also dug up playtest cards that are more than a year old. You will see how my two preview cards began and how they ended. Most cards don't actually make it all the way through our rigorous process, but these two are exceptions. Throughout design and development, the team wanted to capture the feeling of horror—but this time going beyond psychological horror all the way to cosmic horror of unnatural, alien origin. If you've been paying close attention to the artwork in Shadows over Innistrad, there are unmistakable signs of Emrakul's influence. What starts as a normal horse in Shadows over Innistrad morphs into a full-blown Eldrazi Horror by the end of Eldritch Moon. 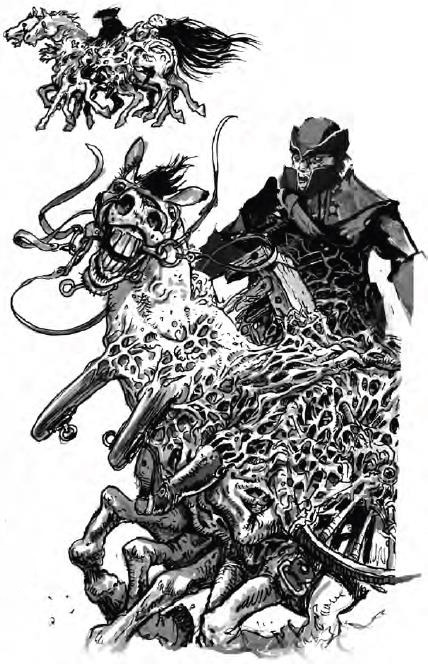 The artwork uses Emrakul's thematic purple-magenta coloring, her lattice-patchwork texture, and excessive tentacle limbs that break up the normal horse silhouette after it's become part of the titan's mutated brood lineage. Eldritch Moon explores what happens when Emrakul's presence starts transforming the denizens of Innistrad into her personal brood of Eldrazi Horrors. My first preview card is indeed a white Knight. What would a Knight riding underneath an Eldritch Moon look like? Something spooky like a Headless Horseman? 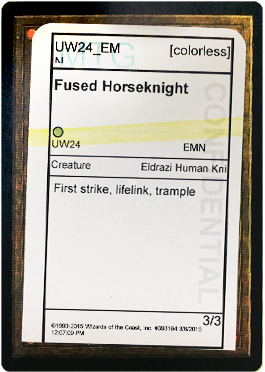 Instead of simply missing one's head, what if the horse and rider shared their heads, fused together into an Eldrazi-fied version of a Knight? This sketch is from the world guide—a document we produce that describes the world of Shadows over Innistrad in illustrative detail along with how it changes during Eldritch Moon. The design team took this sketch and ran with it; we felt it was one level of horror deeper than a mere Headless Horseman. 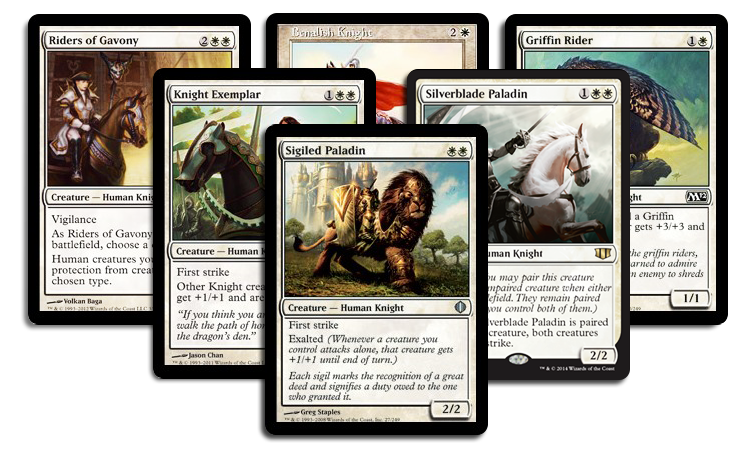 In Knightly fashion, Noble Knight is a 2/2 white creature with some keyword abilities. Because it's a double-faced card, it needs a way to transform to the back side. We thought if death was happening, and the Knight was all alone seeing this death, it would trigger the hulk-out moment. At the time, other white cards were sacrificing things for benefits, so we made this card slot into that strategy. Here's the back side of the Noble Knight: Fused Horseknight! As for most every double-faced card on Innistrad, there's a size upgrade. We added another keyword as well. 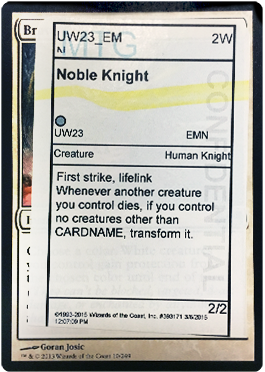 The typeline of "Eldrazi Human Knight" was just a placeholder—there's only so much room here, and eventually Kelly Digges pushed for "Eldrazi Horror" as the default for Emrakul's transformed denizens. Another noteworthy part of this playtest card is the [colorless] color indicator—early on, we knew we wanted the Eldrazi to be colorless no matter what, and double-faced card technology lets us make white cards that become colorless cards. 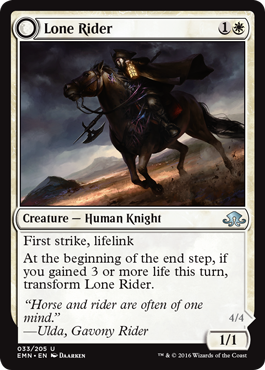 Iterations later led to the final card, which you can find in booster packs when Eldritch Moon launches: Lone Rider! The "quest" to go on to get the transformation changed from a "morbid" death trigger to a more straightforward life-gain mechanic. The innate lifelink lets you use a Giant Growth–like effect, +1/+1 counters, Equipment, or an Aura to boost the Lone Rider's power enough for lifelink to gain 3 life and trigger the transformation, or you can simply cast a life-gain spell like Chaplain's Blessing. Not the hardest quest a transform card has asked, but a quest nonetheless. It That Rides as One is an improved version of the Lone Rider front side. The differential between the front and back side on the final card is more dramatic—from 1/1 to 4/4. Because the artwork by Daarken tells the story so well, design didn't need to do much mechanically to sell the transformation, so we settled on adding stats and trample, as it's the most horse-like ability that a Human would lack (horsemanship and flanking are off the table!). Medium-size white creatures don't typically trample, so we felt the Eldrazi colorlessness and weirdness justified it. Thraben Militia also gains trample for a similar reason. 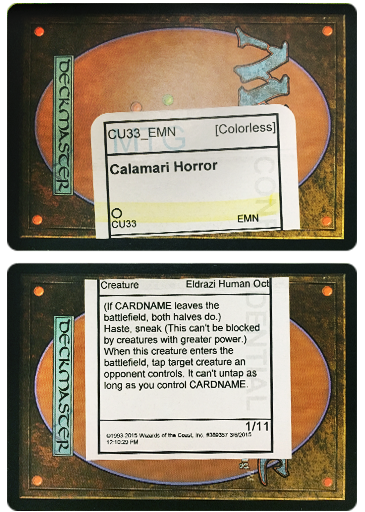 We found from test card frames by graphic designer Liz Leo that a colorless indicator was more confusing than enlightening (during Battle for Zendikar development)—so we backpedaled to more normal colorless Eldrazi frames that bleed to the edges (as "normal" as that is for a Magic card!). 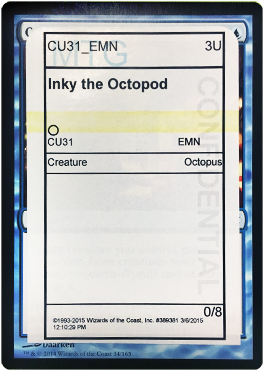 Instead, we have a "moon" indicator for the front side and an "Emrakul" indicator for the back side, showing this creature has joined Emrakul's brood. This is symbolizing one transformation step further from that shown in Innistrad, Dark Ascension, and Shadows over Innistrad, where cards transformed from "sun" on their front sides to "moon" on their back sides. And that's a peek into how we made Magic's grossest Knight. My second and final preview card today began its life as a top-down flavor execution, but also as a proof of concept. 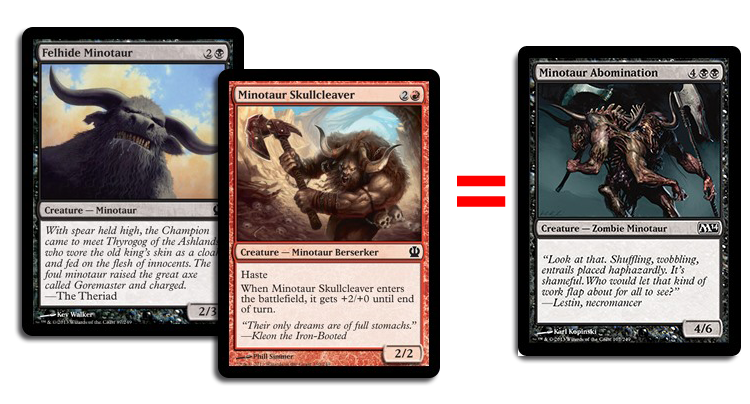 "If you control both Felhide Minotaur and Minotaur Skullcleaver at the same time, they simultaneously transform into an oversize Minotaur Abomination! But imagine it's a gross colorless Eldrazi," I said aloud to everyone. Most people were happy to try this—except the digital card coders (sorry!). I had tried something similar for New Phyrexia that didn't stay through development, but that was ultimately replaced by Phyrexian mana. Previously, I've built a B.F.M. deck—using Victimize and Tooth and Nail in one deck, and good old-fashioned Cabal Coffers plus Diabolic Tutor in another. It's very difficult to summon a Big Furry Monster! In fact, it's too difficult. This would likely be a key selling point mechanic; we needed it to be possible, or else it's a "trap," as we call it—the payoff isn't worth the trouble. However, the Eldritch Moon design team wanted to prove this was possible—in both Limited and Constructed. With the quest to get a meld to happen in Sealed (where you have four Eldritch Moon boosters to draw from) or Draft (where you have sixteen Eldritch Moon boosters to choose cards from), the design team set off to find space for such a card. Since it's a rather difficult feat, we wanted at least half of the pair to be a tough creature that might stick around while waiting for you to draw the second half. We made a blue meld pair and a black meld pair—and all four cards were common. My preview card began its life as the blue meld pair. The concept for the blue meld pair began as a fisherman that reels in too big of a catch. We designed two cards—the fisherman and the fish he was looking to catch. We were looking to see how often they became melded, and whether it was fun. 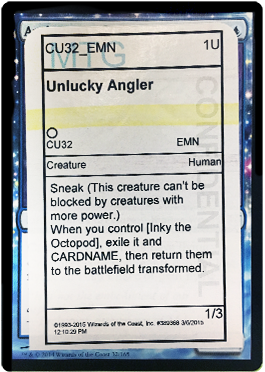 As goofy as a vanilla 3U 0/8 is (it's a common Octopus—but not a 3/3 Giant Octopus), the huge toughness did the trick of staying on the battlefield while also keeping you alive long enough to find the Unlucky Angler. The resulting Calamari Horror was a little underwhelming—we discovered that losing two creatures to get one creature is a huge cost in itself, never mind the difficulty of assembling the puzzle. This is where we also established that melded creatures should always add their power and toughness together, lest there be tons of complaining out loud, in the database comments, and from polls. Players were happy with the story of a fisherman catching an octopus then turning into an Eldrazi. After playtesting this version, we found that the blue pair and the black pair were stealing thunder from each other. There was added irksomeness from opening or passing half of one and half of the other. We trimmed back to just one common meld pair—the black one. The blue one had to go. The Angler and his catch stayed in the set, however, as a single transform card. Keeping the same concept, here is the card as you'll see it in booster packs: Grizzled Angler! 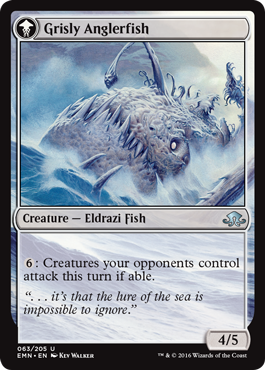 Nowadays, the Grizzled Angler is looking for a colorless "fish" to catch, which could be an Eldrazi, but more likely is an artifact creature. The self-milling ability has ramifications in graveyard-based decks, like delirium. This opens up the deck-building possibilities. The final art from Kev Walker is fun (check out Grisly Anglerfish's "lure"!). We added a "siren's lure" ability to the Eldrazi Fish to call out the lure even more. I hope you've been engrossed by this insight into the design process behind two Eldritch Moon preview cards. I want to the thank all the talented people who worked tirelessly to make Eldritch Moon a reality. I also want to thank you—the players—who keep playing (and who keep us making) the best game ever. If you have any feedback, you can tell me in person at Pro Tour Eldritch Moon in Sydney, Australia, where I'll be witnessing players attempting to sort out the newest Innistrad environment. Stay tuned to my twitter @NorrYtt, where I will be previewing an additional Eldritch Moon card via a guessing game with my followers. It might transform you into Emrakul's brood, or simply drive you mad like the other denizens of Innistrad. Have fun at your local Eldritch Moon Prerelease! Next time you find yourself on Innistrad under an Eldritch Moon, hold your horses—something fishy is going on.